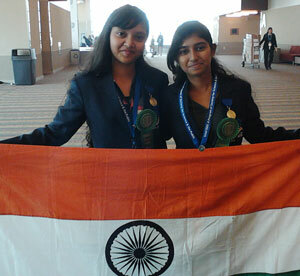 The students from Amrita Vidyalayam, Davangere– Nayana KR and Aishwarya CA of Class 10– have won Fourth Grand Award in the Intel International Science & Engineering Fair 2013 held at Arizona, USA. They won the prize in Mathematical Science Category for their experiment – Dissection of square into ‘N’ congruent squares. The fair was from May 12 to 17. There were 1600 participants from 70 countries of 9 students representing India. These were the last two days before Amma’s Japan-America yatra. Amma came yesterday for Tuesday satsang and mentioned that she would come to the swimming pool in the evening, feed everyone Masala Dosas and mangoes. Later that evening, as promised, Amma came to the pool soon after the bhajans. Amma spent the first one and half hours with Ashram girls. 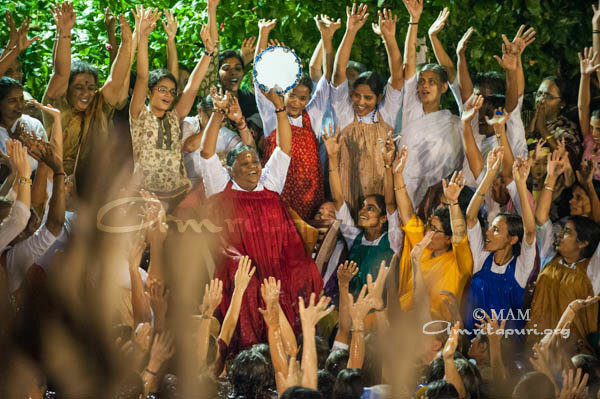 As the girls enjoyed the presence of Amma with them, there were cries of yearning from boys outside “Amme.. Ammme”. As soon as the girls session ended, boys started trickling in. Amma sat at the deep end of the pool and each one got a chance to be nudged into the waters by Amma. With a unique smile, Amma would sweetly ask if each one knew swimming and for those who did not, request a safety ring and keep her bramhacharis ready while she would shove them one by one. She would playfully tease them, evoking peals of laughter from all around. Amma would keep a watchful eye on each person as they dove into the pool, making sure they he would come up and make it safely to touch the side of the pool. Amma asked for a ganjira and started singing bhajans. Her voice overshot the sounds of her children and “He Giridhara Gopala” rang through the night air of Amritapuri. After everyone getting a chance to swim, Amma was alone in the water- swimming and floating in the pool for a while. Her legs were in padmasana, hands were holding mudras with only her forehead, eyes, nose and a small part of her chin above water. All were silent, as lights danced on the ripples of the pool. A gentle breeze caressed every one and Amma was in samadhi. It was blissfully beautiful. After swimming, Amma went back to her room leaving the whole ashram awake, happy and relaxed, remembering her beautiful presence. The last evening before the US tour was the second annual super-special Dosa festival. Even during Bhajans several dosa grills had started sizzling. Amma jokingly started saying “How can the mind be focused (on bhajans) when the smells and sizzling sounds rise on either sides”, as dosas were being made. And between each round of dosas water was used to clean the big grills causing clouds of steam to rise all around the hall. As soon as bhajans ended, Amma climbed down the stage and the Dosa fest began. Amma made dosas with care and then with her own unique style, initiated the distribution process. Amma started serving hot Masala dosas with spicy chick pea curry and freshly cut yellow mangoes from Ettimadai. 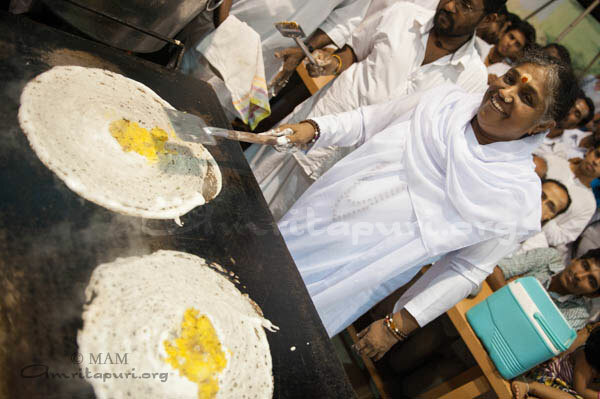 After most of the devotees were served, Amma insisted everyone to take a second portion: “Children, take a second dosa, or cut one in half and share. Don’t worry, we will make more for you. Amma felt all of you should be given a full mango but the person in charge of the kitchen was concerned for the numbers, so he sliced them up, but at least that makes it easy to eat. There is lots more, Please help yourselves!”. Amma then said “may all children be happy in body and mind, may all those here and everywhere be well. Go on eat!”. Saying so, Amma took a bite of dosa after chanting the Bramharpanam mantra. Two very big dosas were made for Amma one from girls side and one from boys. Amma took pieces from each and then distributed the rest to everyone. As stomachs filled, Amma passed the microphone around and asked for people to share jokes. Amma would add spiritual insight into each joke, adding wisdom to the humor. Amma then sang “Maiyyaji me ne tu chahdi’ – Mother I am yearning for you – with a lot of shouts of “oho”, “aha” and ended with “Mata rani ki.. jai”. Amma then left early in the pre-dawn hours for her two month long Japan-America yatra. To Amma, there are no limits. She goes every extra mile to make her children happy. Look at this – an ordinary evening she converted in to a big celebration, made masala dosa and distributed it hot to over 3000 people in an hour and twenty minutes, filled the session with satsang, jokes and bhajans!! Are you looking for miracles? This was one. Br. 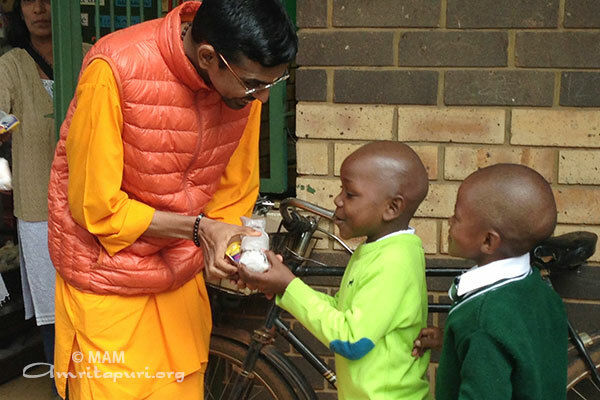 Shubamrita Chaitanya visited Botswana, Zambia and South Africa from April 2 to April 19. Two public programmes were held in Gaborone. It was Br. Shubamrita’s third visit to the country, and the programmes evoked a very good response. Last on his tour, Br. Shubamrita visited three cities in South Africa: Johannesburg, Durban and Cape Town. Apart from two evening programmes in Johannesburg, Br. 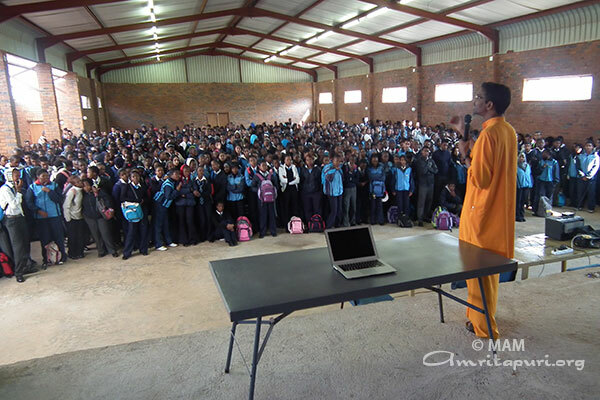 Shubamrita also addressed 600 students of Lenasia South Secondary School on April 12th. The talk was titled “Embrace Your Dreams” and encouraged the students to pursue their individual talents and capacities. Then Br. Shubamrita visited a school and handed out free lunch packets to children from challenged backgrounds and interact with them. He also had a meeting with Ms. Nozipho January-Bardill, Committee member on the Elimination of Racial Discrimination Board, and Founding Chair of SA Gender Education and Training Network, who expressed great admiration of Amma’s humanitarian work and conveyed her invitation to Amma to visit South Africa and extend her arms of compassion to the less fortunate of this country. April 14th, which is celebrated as Vishu, Bihu, and Baisakhi in India, was celebrated by Br. Shubamrita in Sarva Dharma Ashram in Durban, where he was invited for a talk. 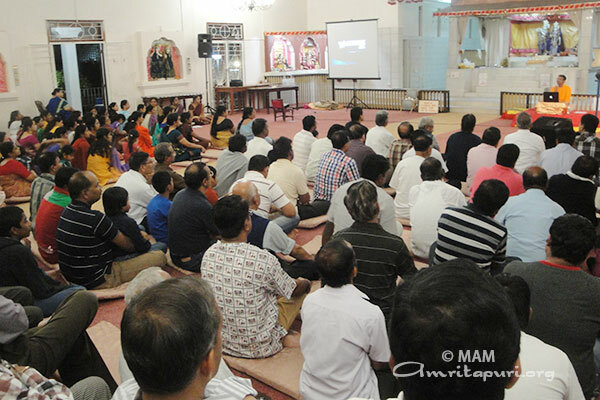 Durban being the home to the largest Indian population outside of India, many South African Indians were happy to have an opportunity to take part in the satsang and bhajans. After the talk, he distributed meal packs to several hundred children from the surrounding settlements and paid a visit to nearby old-age home and orphanage. As the last stop of the tour, Br. 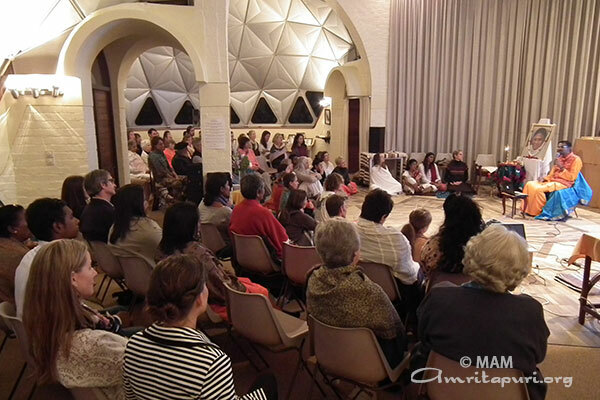 Shubamrita held an evening programme in the Sufi Temple in Cape Town on April 15th. Members of all sections of society attended the event and the enlightening talk: “Happiness is a Decision.” They also participated in the soulful bhajans and guided meditation. The last programme in Cape Town was held at the Brave Foundation headquarters on the 17th. 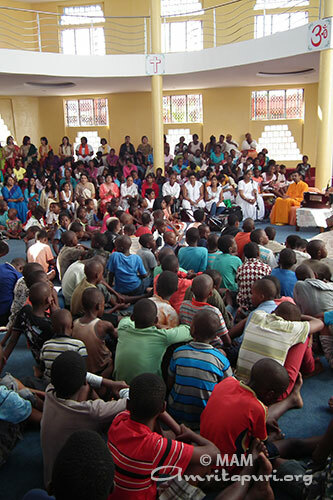 This journey showed that this part of the world has already been bated in Amma’s river of love–a river that is ever ready to grow in size and depth through the sincere devotion and longing of Amma’s African children.